Amazon is adding 50,000 to its ranks. Google is donating $50 mln to training. Touting such plans is a response to fears that tech will, like trade, be blamed for killing jobs as automation and AI take hold. Aping the president’s braggadocio to reduce any sting is a smart move. Job seekers line up to apply during "Amazon Jobs Day," a job fair being held at 10 fulfillment centers across the United States aimed at filling more than 50,000 jobs, at the Amazon.com Fulfillment Center in Fall River, Massachusetts, U.S., August 2, 2017. 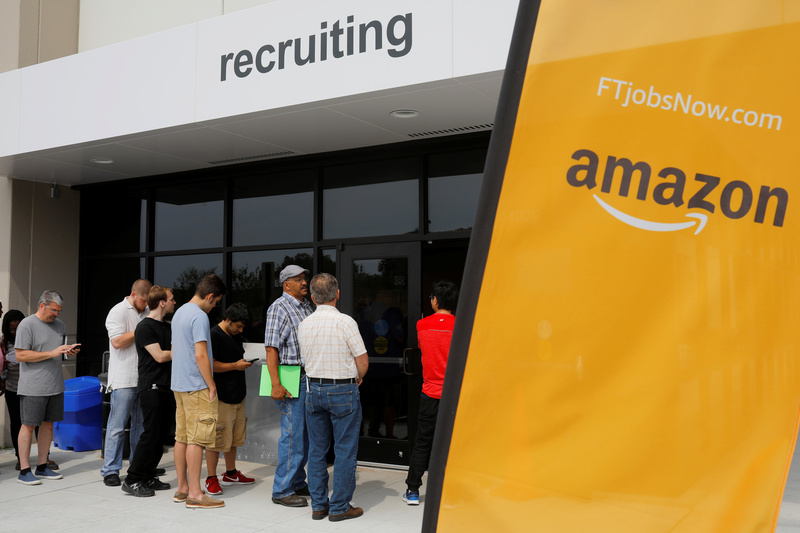 Amazon is hosting a jobs fair in 12 U.S. cities on Aug. 2 to hire 50,000 people for mostly full-time jobs in their warehouses. The company hopes to hire around 100,000 workers by the middle of 2018. Separately on July 26, Google.org, the philanthropic arm of Alphabet, announced a $50 million grant for organizations that help people prepare “for the changing nature of work.” The grant will help fund worker-training programs and initiatives to help improve the working conditions and benefits for those already employed. Code for America and the National Domestic Workers Alliance are among the recipients.